"Click to See Larger Image" for a quick view of the drink menu! 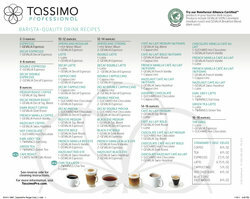 Tassimo Pro Laminated Drink Menu. Each Tassimo Pro machine comes with 3 laminated menus, but if you need more we have them! Comes laminated in a "half sheet" or "front to back" for easy viewing. Now you can become your very own coffee shop barista! What are your staffs favorites? Write a review and let us know!